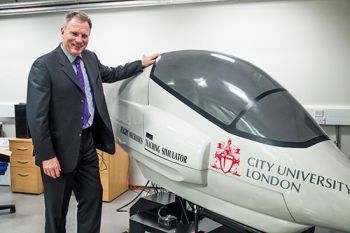 City’s Director of MSc programmes in Air Transport Management/Aircraft Maintenance Management, has become the Executive Chairman of the International Pilot Training Association (IPTA). Captain Tilmann Gabriel has been appointed as Executive Chairman of the International Pilot Training Association (IPTA). He succeeds Peter Barrett, who successfully led the IPTC from its inception and will continue as Vice Chairman. The IPTA is the successor body to the International Pilot Training Consortium (IPTC) formed in 2011 by the heads of the International Air Transport Association (IATA), the International Civil Aviation Organisation (ICAO), the International Federation of Air Line Pilots’ Association (IFALPA) and the Royal Aeronautical Society (RAeS) with the International Coordinating Council of Aerospace Industries Associations (ICCAIA), joining in 2013. Captain Gabriel is delighted with his new appointment and says the IPTA “has achieved important objectives”. He adds that IPTA, “will make an even greater contribution with an expanded and more inclusive group of stakeholders, including the major civil aviation aircraft manufacturers and flight crew training providers”. A former senior aviation executive with over 35 years in the aviation industry, Captain Gabriel spent 20 years as a Lufthansa Executive and Training Captain. His wide-ranging experience encompasses airlines, helicopter and business jet operations, and aircraft manufacturers. He has delivered results for clients such as Safi Airways, Qatar Airways and CHC. Captain Gabriel is a Fellow of the RAeS and a managing partner with tiansalo.